77. Human Resources Management: Attracting & Selecting the Best Candidates – How to Shape Human Behavior. 00:00:40 Attracting the right people and selecting the right people are two different problems. 00:01:45 Most companies really suffer from a significant talent shortage. This problem will be more tramatic in the future. Your employer brand, congruent to your brand strategy, is your promise to specific people in order attract their attention and convince them to want to work with you. Institutions are required to be active because the most talented, well-qualified and motivated job candidates are rather passive in the sense that he or she isn’t attending career fairs, browsing job ads, or actively looking for a job. There is a talent shortage. You cannot assume everybody wants to work for your company. 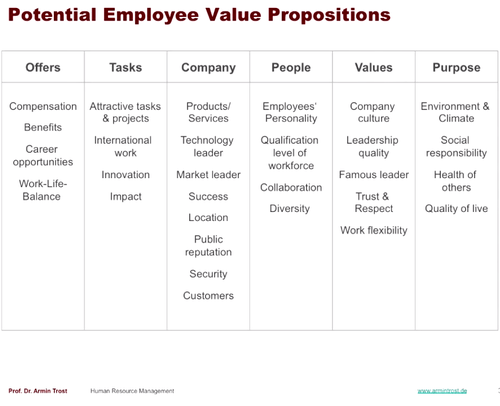 Market your employee value proposition with the strengths competitors have not claimed. 00:16:50 Of course every human connection is useful, but recall that the candidates you want aren’t actively seeking a new job. Therefore for your company, the ROI of career fairs where you pay to set up a booth, display job positions, collect CVs and even conduct on-the-spot interviews is more in public relations and brand exposure than actually finding qualified candidates. Not appearing at a career fair alongside your competitors sends a bad message about you and gives your competitors leverage, and hints of potential financial difficults since your company doesn’t appear to be hiring or growing. 00:24:55 Executive searches involving secretly contracting a headhunter to fill a specific high-level position or to replace an existing executive not only help you steal the best people from your competitors and other leading companies, ‘off limit companies’ and conflict-of-interest clauses prevent that headhunter from stealing your best people from you; a modern-day equivalent of paying the mafia not to set your business on fire. 00:40:00 High-level and highly-qualified people are ambitious, and are always in search of something bigger and better. 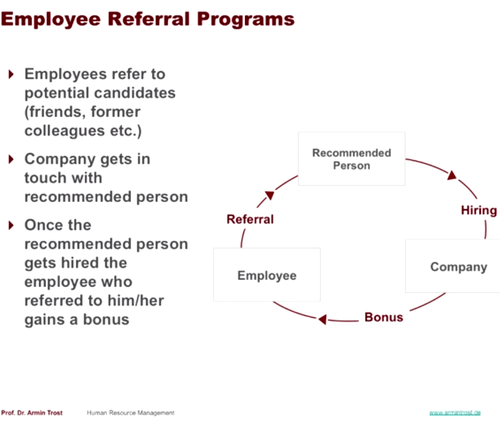 Therefore, sign-on bonuses are usually included because so much time and money has already been invested in recruiting the person that the company would rather pay additional money to prevent the person from changing his or her mind and having to start all over from zero. Your brand is “a name, term, design or other feature that distinguishes one seller’s product from those of others.” Every brand is linked to something and this is intentional. Companies invest a lot of money linking their name and logo to some very concrete ideas and promises. This is the job of marketing. Building your company’s employer brand is crucial to attracting the right kind of people to work for you. The copy you write on your career website determines who you attract. 01:14:44 In human resources, line engagement refers to the total amount of persons in your company who is actively involved in recruiting. Weak ties are important. Weak ties are people you know and perhaps haven’t seen for a while, but there has been a little level of trust established. You may not even be sure you’ll ever meet these people again in life, but they are there and you know them. Put all this together and we know that people have huge networks, and there is this law of small world that every person knows every other person in the world by a very few instances. High line engagement would include offering bonuses and incentives to employees who convince qualified friends and contacts to apply for employment with your company. 01:18:20 If you have limited resources, you have to focus on identifying, prioritizing, building relationships with and marketing to just a few key places. It’s all about personal and mutually-beneficial relationships and partnerships. 01:21:20 A Players are the best, B Players are average, and C Players are below-average. In terms of social networking, A Players know A Players. Strong people know other strong people. Humans try to build relationships with people who are more or less equal to ourselves. We know this from research. This means that once you have great people in your company, they probably know other great people outside of your company with similar mindsets, attitudes and work style. 01:34:10 Aggressive, low cost and hight impact; this is guerilla marketing/recruiting. Posted on February 26, 2015 April 24, 2017 by Joshua SMITHPosted in videosTagged Armin Trost, best practices, headhunters, hochschule, human resources, linkedin, social engineering, talent acquisition, videos, youtube. Pingback: 81. Human Resources Management: Motivation With Compensation & Benefits – How to Shape Human Behavior. Pingback: 78. Human Resources Management: Recruitment From Application To Offer (Pt. 1) – How to Shape Human Behavior.